Be absolutely sure to investigate passport requirements very thoroughly before booking your cruise. A passport can mean the difference between taking a fantastic trip… and not taking one at all. As of June 1, 2009, the U.S. government implemented the full requirements of the land and sea phase of Western Hemisphere Travel Initiative. Be sure you are in the know about this important issue. Find out more information here. Get the newest information on your passport, visa, and health requirements-which can vary by travel mode-well in advance of your trip. Remember, you need to allow at least 6-8 weeks to obtain a passport. Expediting services are available, but expensive. Please see list of expediting services below. Crossing borders only by land and sea? You may have another identification option. Enhanced Driver’s Licenses (“EDL”) are now being issued or will be issued by six states: Washington State, New York, Michigan, Vermont, California and Arizona. 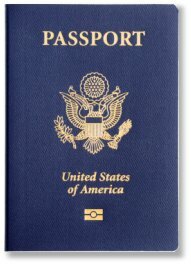 The EDL can be used by U.S. citizens for entering the U.S. at land and sea ports of entry instead of a passport card or book. The EDL gives the holder the right to drive a vehicle, it proves the identity of the holder, and it proves the U.S. citizenship of the holder. Because the EDL passport card is restricted in use for crossing borders only by land and sea and cannot be used for international air travel, it is recommended that travelers still maintain a traditional passport. For more information on the EDL, please visit Homeland Security’s webpage by clicking here. Citizens of states not issuing an EDL cannot obtain one and must apply for either a passport card or a passport book. For more information, contact the DMV in the issuing state. For a list of links to the 50 states DMV webpages, click here.